The vehicle landed 25 feet down to the river and was partially submerged. MADRID TOWNSHIP — A New Hampshire woman was injured Tuesday afternoon when she lost control of her SUV and it careened into the Sandy River. Kari Gauthier, 39, of Portsmouth complained of leg pain and was taken to Franklin Memorial Hospital in Farmington, according to Franklin County Sheriff Scott Nichols Sr. 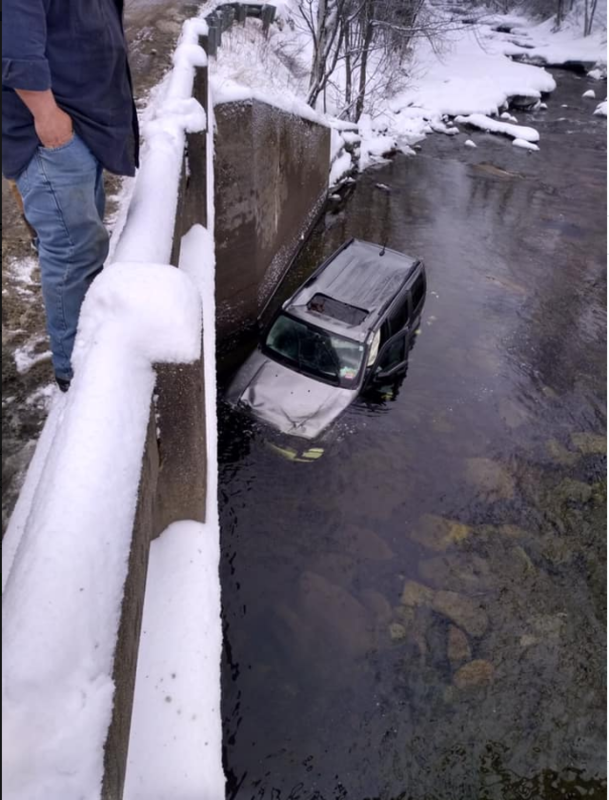 The 2012 Jeep Liberty dropping 25 feet from the bridge and landed in water up to its doors. Chief Deputy Steven Lowell investigated the accident, which was reported at 1:56 p.m. The Phillips Fire Rescue Department assisted at the scene. Sanders Auto Service of Phillips removed the vehicle from the river. The accident was one of several Tuesday afternoon as the region was hit with snow and sleet.